McAfee Customer Service provides Internet users with additional help. Here we look at which McAfee Customer Services will help home computer users the most. We look at some of the free tools McAfee technical support offer to determine things like how secure your PC is. We also look at some of the security alerts home users can subscribe to, and outline some of the good practices to keep you and your family safe from Malware. Those hard to find Customer Service contact telephone numbers are also provided. Part 1 McAfee Free Virus Scan shows you the McAfee antivirus package features, how to get the 30 day trial version, and what to consider if you prefer to use a free anti virus program instead. Part 2 looks at McAfee Computer Virus Remover tools I think help to further protect your computers. Are you aware of them? Take a look for more details! Part 3 shows you how to use the McAfee Removal Tool. Removing McAfee products appears to cause lots of home computer users problems, including computer instability. This tool helps you avoid this scenario. Each section of this page is listed in the table of contents below. This gives you the option to either read through the whole page, or hop to the bit that interests you. Please complete the form at the bottom of the page which gives you the opportunity to share your stories about Customer Service. Was it good? Was it horrible? Was it hilarious? Take the opportunity to write your own web page and share your customer service experiences with the world! At the bottom of the page are experiences shared by other visitors to this page. The McAfee Global Intelligence web site (Opens New Window) tells you about different types of viruses and other types of malware threats in real-time. For example, the Recent Malware link tells you about the latest computer viruses and provides additional details such as what the virus does and how you can clean computer virus threats from your machine. The next part outlines suggested hints and tips to protect yourself from online malware threats. McAfee Customer Service provides a list of Tips (Opens New Window) to customers about how to protect yourself and keep your computer virus free. The customer service list is summarised below, with some additional tips provide by me based on years of client experiences. Do not automatically open e-mail attachments, especially if you do not know the sender. Delete without opening! If the e-mail is from someone you know, consider whether they would send this e-mail and attachment. Do you recognise their style of writing? If in doubt do not open! If you and your family are cautious with your web surfing, and smart when it comes to computer security, you can avoid paying for online services such as the McAfee Virus Removal Service (Opens New Window). The next section looks at the technical services McAfee offer that home computer users can take advantage of. 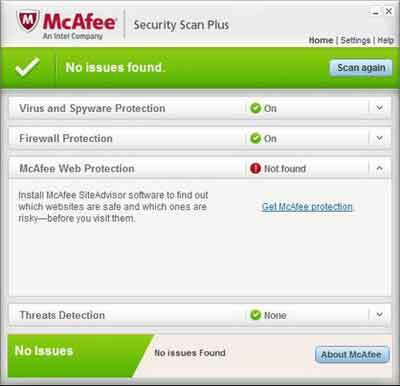 McAfee Customer Service also offers the McAfee Security Scan Plus Tool (Opens New Window). This checks your system and lets you know if you are adequately protected from security threats. To use this tool. Left click Scan Now on the McAfee Security Scan Plus web page. Save the SecurityScan_Release.exe file to your computer when prompted. Double left click the downloaded files and click the install button when prompted. 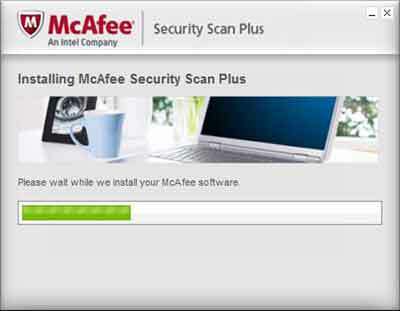 The McAfee Security Scan Plus software will install. Tick the I have read and accept the License Agreement (Required) box then left click the continue button. Select the Scan Now button to start the scan of your PC for potential threats. The tool will assess your PC and let you know if there are any problems. In the example below, the McAfee customer service tool has detected I don't have McAfee Web Protection installed. If you select the Settings option at the top right hand corner, you have the option to schedule when the McAfee Security Scan Plus tool runs on your computer. I have mine setup to run every Monday at 22:00 and to automatically update my version of Security Scan Plus if available. The next section looks at the free McAfee Virtual Technician tool. McAfee Customer Service also offer the McAfee Virtual Technician tool (Opens New Window). This is a free of charge customer service from McAfee that scans your installed products and attempts to fix any identified issues. Select the McAfee Virtual Technician link above then left click the Start button. Run the MVTInstaller.exe file when prompted. Left click the I Agree button when prompted. The McAfee Virtual Technician tool will install onto your computer. Before completing the installation process, you are given the option of scheduling when the tool checks for problems. Select the Finish button when you are ready. Once it is finished installing, launch the tool from the shortcut on your desktop if it does not auto launch itself. It will check your PC for any problems with your installed McAfee products. If any issues are found you are prompted to fix them. I tend to just go with the Autofix option straight away (Select Next to continue). You can Get More Detail on the problem(s) if you wish. Rave about how McAfee Customer Service helped you to fix a problem? Enter Your Title e.g. "McAfee Customer Service Nightmare"
Click on the links below to see what other visitors to this page have written about their McAfee customer Service experiences.